The vibratory finishing system is designed with PLC control for all steps of surface finishing from start to end. 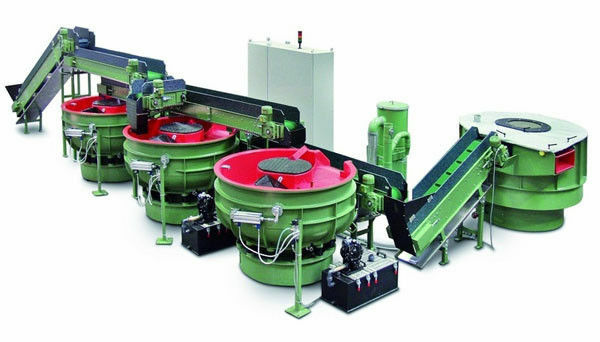 The automatic vibratory finishing system is designed with PLC control for all operation steps, including vibratory finishing, water cleaning & anti-rust proof process, vibratory drying, and waste water recycling. The machine maximizes the output of the whole finishing process. It intergrates all the finishing parts of the whole system. Effectively with less man power involved. Furthermore, the water recylcing system takes the advantage of less pollution and economically using of water and compound. The vibratory finishing operation can be customized according to different application of different work parts. minimize the cost of production. Good efficiency of heating. The vibratory dryer takes the design of heating in two ways by different position. It can eliminiate problem that the parts get rusted when heating not enough, also another problem of with heating too quick with water mark appear after heating process. The machine adopts the new type of heat resistant rubber, and it can successfully avoid of the PU torn off problem after heating up over Celsius 100° .